The Ford Mondeo 2001 was one of the earliest models from Ford Mondeo’s second generation of cars, which dominated the market from 2000–2001. The Prodigy car idea was applied to these new models, resulting in a sensible, unobtrusive look that ranked high in maturity but was much less distinctive than the generation one cars. In the new model, Ford addressed two of the biggest weaknesses found in previous models. The first was lack of legroom, leading Ford to increase the wheelbase of the Mondeo, and a new line of Duratorq diesel engines replaced the moderate diesel engine. The Ford Mondeo is one of the most popular cars worldwide, and while the more recent models have obviously taken over the market, this 2001 model remains a favourite among its fans who bought it over a decade ago. The 2001 model retained the 90s style interior that lends a certain old age quality to the car, and it still has the Ford oval clock in the dash. 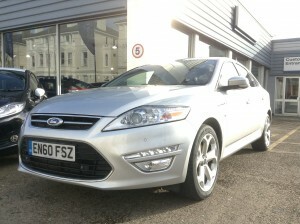 As usual, this Mondeo is an extremely safe car that handles the roads smoothly and its steering circle is tight and reliable. The older models used to have trouble with engine noise reaching the interior, but the 2001 model has no such problem. The engine noises have been nullified, as has the wind noise that used to be encountered when going over a certain speed. Passengers in the back seat have no complaints as the new space in the Mondeo provides ample legroom for maximum comfort. The 1.8 Duratec 125bhp can go from 0 to 60 in 10.6 seconds and has a relatively high top speed of 128 mph. The combined mpg of the vehicle is 36.22 making it fairly fuel-efficient. While the new models of the 2001 Ford Mondeo had very few troubles, now that they have some years behind them there are a few glitches here and there. A common problem seems to be premature starter motor malfunction, often preceded by a distinctive whining in the starter motor. If the brake discs get too hot they have the propensity to warp. This is not a problem specific to the 2001 model, but rather Mondeos as a whole. The biggest problem with the 2001 Ford Mondeo is a failure in the cooling systems. The thermostat, water pump and temperature sender unit can malfunction, and if this isn’t noticed and fixed, it can result in a complete seizure in your engine. When this happens, scrapping may be a cheaper option. If you need to scrap your Ford Mondeo 2001, contact Scrap Car Kings for a complete, hassle-free service.